A week to savor fresh, local and delicious trends in ways Americans eat. 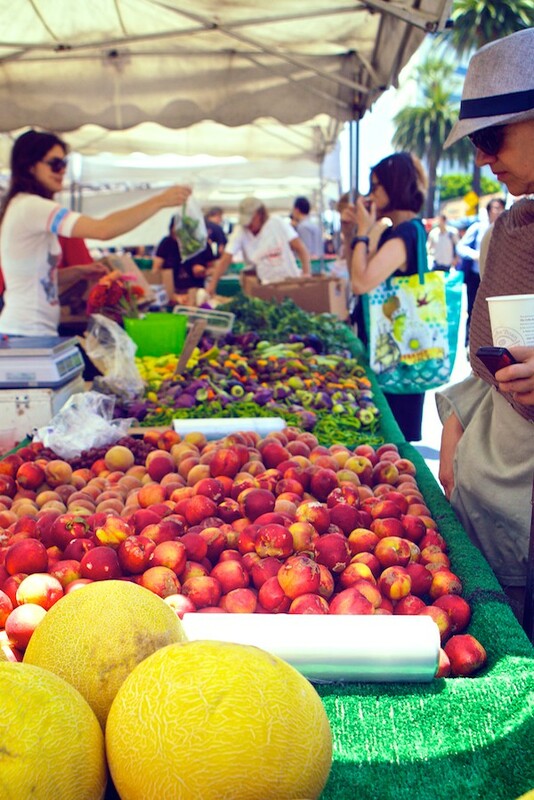 Buyers getting their weekly portion of fresh and healthy at the Santa Monica Farmer’s Market. August 7, 2013. Our agency and personal interests in health, wellness and great food come together every Wednesday, just a few blocks away the intersection of Arizona and 3rd St. In fact, this is National Farmers Market Week, so we thought we’d commemorate it with a series of images, shot today at the Santa Monica Farmer’s Market. Which is also a great reminder of positive trends threading through our lives toward food that’s healthier and fresher; food that’s grown locally and more sustainable; and food that, well, just tastes better. We’re not kidding ourselves — sophisticated fat-, sugar- and salt-delivery vehicles (otherwise known as junk/fast food) aren’t going anywhere soon. But the trend toward great food has established a foothold (a “food-hold”? ), and awareness, acceptance and engagement are growing. Even industry journals like Food Technology (in an April, 2013 article) have taken notice: Healthier food, tastier food, safety concerns (think: beef saturated with anti-biotics), and moms searching for organic and natural alternatives dominated their list of the top 10 food trends for 2013. Sounds like they’ve been spending some time at the market, too.